Dr. Philip J. Parker, a resident of West Bloomfield, Michigan, died on April 20th, 2016 at the age of 72. Funeral services arranged by The Dorfman Chapel. Beloved husband of Fran Parker. Dear father of Rebekah (David Wilansky) Parker and Daniel (Sasha) Parker. Loving grandfather of Reagan. Adoring son-in-law of Viola Klein. 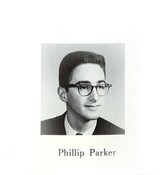 Cherished brother of the late Dr. Steven Parker. Brother-in-law of Karen Parker, Jeff Klein, Al Klein, Howard Friedlaender, Susan Friedlaender and Victoria Klein. Also survived by his devoted caregiver, Bella and many loving cousins, nieces, nephews, colleagues, patients, other family members and friends. Click here to see Philip J. 's last Profile entry.